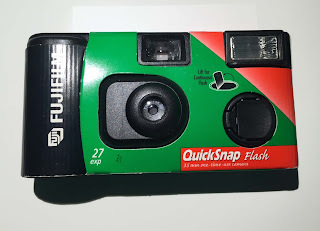 While cleaning out my older son's kitchen "junk drawer" a few years ago (he's been out on his own for about 7 years) I found this one time use Fujifilm QuickSnap Flash. This is one of those disposable, 1-time use cameras. Well, I put it in my camera equipment closet and forgot about it. The other day I was looking for a piece of kit I needed for a fashion shoot and I found it again. I flipped it over and it had been fully used. It had Fujifilm Superia X-TRA 800 film that could be developed with C-41 chemistry. I had no clue what was on it nor did he, so I figured, WTH, might as well try to develop it. Understand, I have zero clue how to properly take one of these apart, so I basically put it in my black bag with a can opener and big pair of scissors. Well, after fumbling around in the dark for about 10 minutes I hacked it open and out popped a roll of film into my hand. I put it on the developing reel and developed it tonight. After a quickie inspection it looks like all the images are underexposed. This is surprising since it's 800 ASA film. My guess he shot it in a room or during a party and didn't use the optional flash. I can make out about 10 of 27 images, so once the film dries I'll put it on the light table and see if there are any photos worth scanning. It would be super cool to get a shot that my son took about 7-10 years ago. I'll check back, of course as long as they are not NSFW type photos....yikes, hadn't thought about that. The aftermath. No wonder it's one time use. 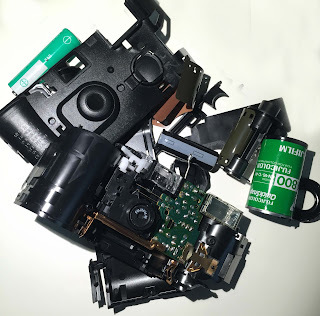 I might try to salvage the lens & flash to see if I can do any hacks with them.